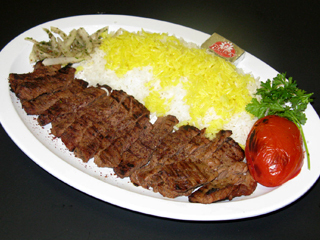 Kabob Cafe is a cozy Persian and Mediterranean restaurant that opened on November 2009. It is owned and operated by a Persian family that treats you as we would our own. Every dish is made with your health and satisfaction in mind, which is why we only use fresh quality products, traditional Perisan recipes, and cook every meal when ordered. We serve more than 10 different Kabobs, grilled fresh and daily on an open fire. We also offer a variety of appetizers, sandwiches, entrees, and weekend specials. Whether you’re visiting us, ordering for takeout, or using our catering services, we know you will have a memorable experience at Kabob Cafe.